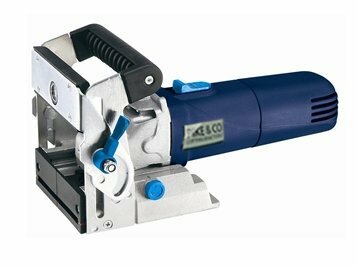 The biscuit jointer is suitable for milling slots for shadow joint connections in compact wood, plywood and chip boards. It serves edge connections for manufacturing properly matching, firm and safe wood joints with Lamellos, e.g. with timber frame, slots for crosswise -, longitudinal connections. Features - Multi purpose rail setting - height adjustable up to max. 6 cm - steplessly tiltable up to 180° - 3-step quick adjustment of the routing depth - Wide base plate - Locking button for router changes Power 860W Idle speed 11000 min-1 HM-router bit Ø 100 × Ø 22 × 3,8 mm Routing depth max.